Lexington, Ky. – A lovely weekend at the Kentucky Classic CDE played host to the 2016 USEF Pony Driving National Championships. Held October 6-9 at the Kentucky Horse Park, the championships crowned two National Champions: Leslie Berndl and Katie Whaley, along with their talented ponies. Berndl (Newcastle, Calif.) and Sweetwater’s Zorah Belle began their quest for a national title with a lovely dressage test to win the phase with a score of 53.69 from the Ground Jury of Anne-Marie Turbe (FRA), Elimar Thunert (GER), and Kail Palmer-Miller (USA). Berndl boldly drove Teressa Kandianis’ 2004 Norwegian Fjord mare in the marathon phase, having the fastest times in four of the seven obstacles designed by Richard Nicoll (USA). They won the phase and added 86.19 penalties to their score. Despite the fact that less than three points separated first and second place, Berndl and Sweetwater’s Zorah Belle kept their cool in the cones phase to have a double-clear round and earn the USEF Single Pony Driving National Championship title with a final score of 139.88. Two-time National Champion Tracey Morgan (Beallsville, Md.) and longtime partner Fuego 88 collected Reserve Champions honors after an excellent performance throughout the weekend, beginning with a smooth dressage test that scored 54.04. Morgan and her own 2001 German Riding Pony gelding were determined on the marathon course, having a bobble in obstacle three but rallying to finish with 88.42 penalties. They ended the competition with an impressive double-clear cones round to win the phase and solidify their Reserve Champion title with a final score of 142.46. Rebecca Gutierrez (Windsor, S.C.) and Naria BW6, Richard Olson’s 2003 Haflinger mare, finished in third place with a final score of 152.44. The duo scored 61.51 in the dressage phase and collecting 90.02 and 0.91 in the marathon and cones phases, respectively. Whaley (Paris, Ky.) drove her own and Barbara Sims’ Welsh geldings to win her first USEF Pair Pony Driving National Championship title, winning each of the phases along the way. She had a wonderful dressage test, scoring 49.67 to take the early lead. Whaley attacked the marathon course with her pair and had the fastest times in all of the obstacles, collecting 90.25 penalties. They delivered another quality performance in the cones phase with a single ball down at obstacle nine for 3.00 penalties, winning the championship with a final score of 142.92. Jennifer Matheson (Aiken, S.C.) and Katrina Becker and Mary Anne Boyden’s mixed pair began the championship with a respectable dressage test for a score of 58.13. Matheson and the ponies had a solid marathon performance, collecting 102.42 penalties and finishing second in the phase. They closed out the competition with three balls down in the cones phase for 12.00 penalties, finishing second in the phase and obtaining Reserve Champion honors. Find out more about the Kentucky Classic CDE and view the complete results. Raeford, N.C. – The 2014 USEF National Single Horse Driving Championship came to an exciting conclusion on Sunday in the cones phase of the Southern Pines CDE. On another beautiful day at the Carolina Horse Park, 2013 Champion, Leslie Berndl, held her nerve to drive a near flawless effort over Richard Nicoll’s cones course to retain the title. Berndl (Newcastle, Calif.) and 13-year-old KWPN gelding Uminco were the final competitors to tackle the cones course in the championship finishing within the time allowed and only dislodging two balls to add six points to their overall score. They finished on a total of 119.67 on weekend that surpassed expectation for the World Championship veteran. “It was amazing, just amazing,” said the back-to-back Champion of her time at the Southern Pines CDE. Berndl spent the winter training and competing in Florida and came to the Carolina Horse Park with her sights firmly set on claiming the 2014 title. “It doesn’t feel real,” said of Berndl of winning the USEF National Single Horse Driving Championship for the second time. Earning Reserve Champion honors was Suzy Stafford (Wilmington, Del.) and PVF Peace of Mind on a score of 122.43. The 2011 FEI World Driving Championships for Combined Ponies Individual Silver medalist and her own seven-year-old Morgan mare added 2.8 time faults and three penalties for a single ball down on the cones course to finish less three points behind Berndl. Finishing in overall third place were Donna Crookston (Saltsburg, Pa.) and her own 18-year-old Morgan gelding RG Cowboy’s Black Cadillac on score of 140, rising one place after the marathon as the only entry to drive double clear on the cones course in the Single Horse division. Raeford, N.C. – Competition at the Southern Pines CDE officially got underway on Friday at the Carolina Horse Park with the USEF National Single Horse Driving Championship closing out the day. Following the completion of the dressage phase, Leslie Berndl holds the early lead after an impressive test that earned high marks from the Ground Jury of Peter Bonhof and Martha Hanks Nicoll. Reigning National Champion, Berndl (Newcastle, Calif.), entered the ring on a mission, looking to head out on Saturday’s marathon in pole position. Driving her own 13-year-old KWPN gelding Uminco, she produced a flowing performance which was highlighted by powerful trot-work and solid transitions to score 34.24. Berndl and Uminco will head onto the marathon with more than a four-point lead over the rest of the field. Driving into second place on Friday were Suzy Stafford and PVF Peace of Mind on a score of 38.59. The 2011 FEI World Driving Championships for Combined Ponies Individual Silver medalist and her own seven-year-old Morgan mare lay within striking distance of clinching their first USEF National Single Horse Driving Championship title with two phases left to drive after an expressive test on Friday. Kate Shields (Middleburg, Va.) drove her own 13-year-old Welsh Cob gelding, Hastening Winslow, into third place on Friday with a score of 43.14. Competition continues Saturday as drivers head out onto Richard Nicoll’s marathon course. Lexington, KY – Rain fell for most of Sunday morning at the Kentucky Classic CDE; it fell so hard that Competition would eventually be stopped, but not before two individual drivers hit career milestones. Leslie Berndl earned her first USEF National Single Horse Driving Championship, and Chester Weber made it an official decade of dominance with his impressive and unprecedented tenth USEF National Four-in-Hand Driving Championship. 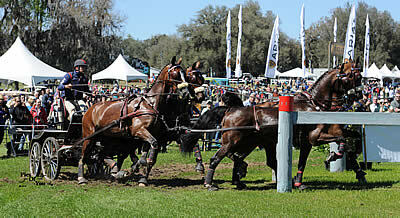 Weber (Ocala, Florida) held a sixteen penalty lead heading into Sunday’s cones phase. By guiding his and Jane Clark’s team of Dutch Warmbloods deftly through the obstacles he emerged from the ring with 9.06 penalties, and his tenth USEF Four-in-Hand National Championship. For Weber it’s another feather in the cap of an already very successful season. With his success in Europe over the summer, a 2014 WEG test event win at CAI-Caen, a win at CAIO Saumur, and top three finishes at Beekbergen and Aachen, this landmark national championship makes Weber’s 2013 campaign one of the best in recent memory. Weber finished on a total score of 141.20. Finishing second was Jimmy Fairclough (Newtown, New Jersey) on a score of 173.95. Leslie Berndl also held a double digit lead entering the cones. She and Uminco held onto that advantage and emerged from the rain as USEF National Single Horse Driving Champions. Berndl (Newcastle, California) earned an 11.00, good for third place in the phase, and finished with a 141.53 total score. She was second in the dressage phase, second on the marathon, and the most consistently good single horse competitor over the entire weekend. This is Leslie Berndl’s first National Championship. 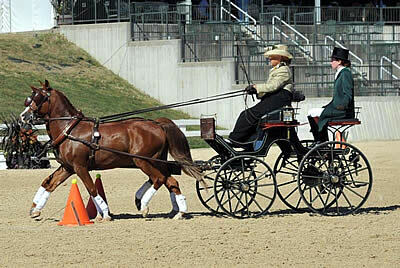 Umnico was driven to a National Single Horse Championship in 2009, also at the Kentucky Classic CDE, by his owner Fritz Grupe. Finishing first in the cones phases were Donna Crookston (Saltsburg, Pennsylvania) and Cowboy’s Black Cadillac. They scored a 3.00 and moved up from third place after the marathon to second place in the end with a final score of 155.29. Second on the cones and third overall were Sara Schmitt (Flemington, New Jersey) and Savannah. Their final score was 160.80. For complete final scores, click here. Lexington, KY – A good crowd turned out at the Kentucky Horse Park Saturday to watch the marathon phase of the Kentucky Classic CDE. 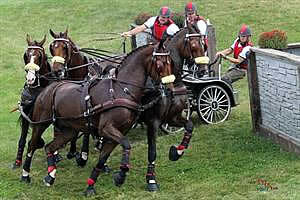 When the driving was done and the spectators had left Leslie Berndl had taken a big step into the lead in the single horse division. In the four-in-hand division, Chester Weber’s path toward a tenth Four-in-Hand National Championship has become a little clearer. Berndl (Newcastle, California) started off hot Saturday morning behind Dutch Warmblood gelding Uminco and her consistent driving over the entire course helped her take the lead in the division. Berndl was in second place coming into the day, having been bested by less than one point in the dressage phase on Thursday, and right away she looked to make up that difference. Of the eight hazards, Berndl was fastest through the first two and second best through another four. She finished the marathon in second place with an 84.24 score and now sits in first place with a total score of 130.53. 1999 National Champion Kimberly Stover (Smyrna, Delaware) is the closest to Berndl. She sits in second with 148.80. 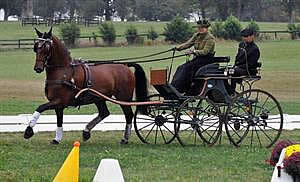 Sara Schmitt (Flemington, New Jersey) won the marathon driving Savannah and is now in fourth place overall. After a narrow victory in the marathon, Chester Weber is poised to earn a record setting tenth National Championship. 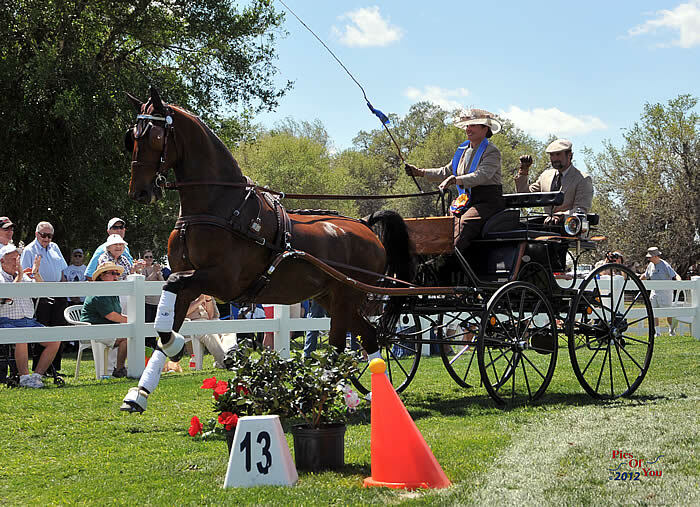 Weber (Ocala, Florida) was first four-in-hand driver on the marathon course with the team of his own and Jane Clark’s Boris, Splash, Boy W, and Ultra. To the delight of a flock of fans following him from hazard to hazard, he proved to be the day’s best. Weber’s 98.40 gave him a slight edge over Jimmy Fairclough (Newtown, New Jersey), who finished with a 98.89 behind the team of Charlie Brown, Kavango V. Falkenstein, Valentino, and Zenden. Thanks to a great score in the dressage on Thursday, Weber carries a significant overall lead into Sunday’s final cones phase. His 132.14 score after two phases is more than 16 points ahead of Fairclough’s 148.95 total score. Casey Zubek (Manhattan Illinois) is in third with a 261.80 score. Full marathon results are online here. Wellington, FL (May 4, 2012) – Three talented combined drivers drove away as winners of the World Development Group sponsored Triple Crown, after edging out their competitors by earning the highest score at three events – the Live Oak International CDE, Sunshine State CDE and the Little Everglades CDE. The World Development Group, a premier developer committed to building the equestrian lifestyle in Wellington and around the world, sponsored the Triple Crown that culminated at the Live Oak competition in Ocala. Bettina Scherer, who won the Preliminary division, said, “I competed my Welsh pony Rio in the three combined driving events and won the Triple Crown for the Preliminary Single Pony. I didn’t set out with a plan to capture the Triple Crown, I knew that you had to compete at all three events, but I am thrilled to have won.” Boots Wright the Intermediate division and Leslie Berndl was the FEI Winner.